February 21 – March 8. 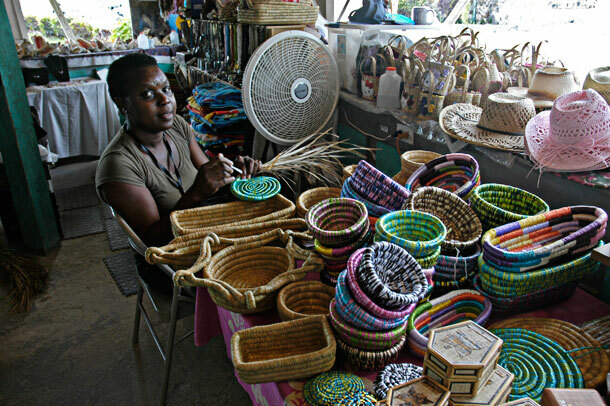 One of the vendors in the Straw Market makes new wares. Everyone in here was very friendly. We think they make up their prices on the fly, depending on the congeniality of their customer. 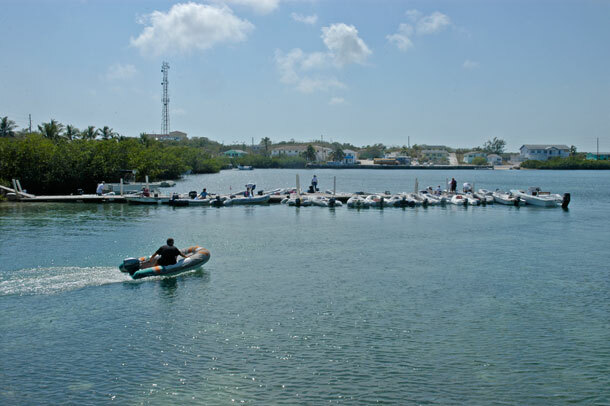 Georgetown is a great place to visit if you live on a shallow draft boat or have a high speed dinghy. 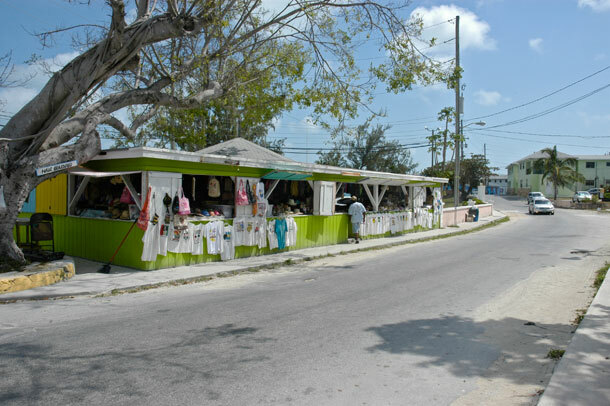 The town itself is on Great Exuma Island. 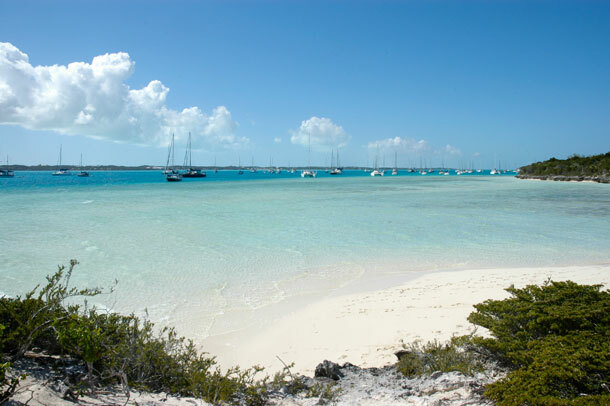 To the northeast the Stocking and Elizabeth Islands protect the town from Exuma Sound, forming the two by four mile Elizabeth Harbour. The harbor is a mecca for sailors. There are hundreds of boats here for the annual regatta. 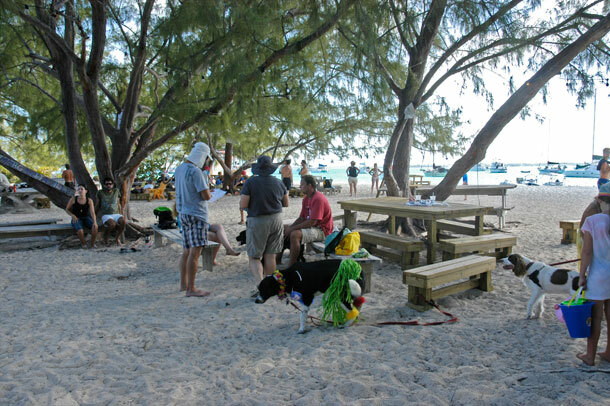 Most of the cruising entertainment happens on Stocking Island or in town. The anchorages in these spots are packed tightly with folks who would rather ride out bad weather than give up their prized locations close to the activities. 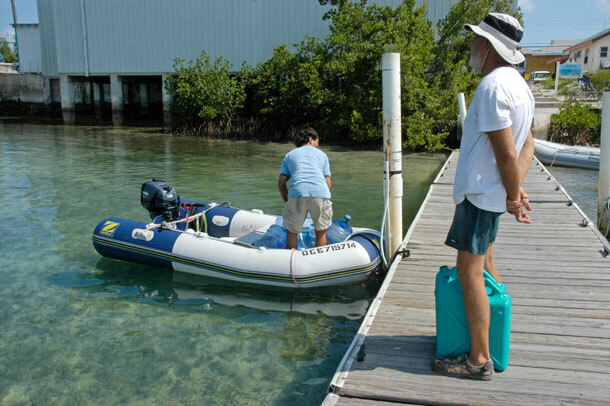 We visit these places for a few events and to provision, but mostly we stay in protected Crab Cay, which is a long dinghy ride from all the action. Action, what action? Well normally there are massage, mahjong, yoga, plein air painting, bridge, dominoes, softball, volleyball, beach church, cookouts, and jam sessions. 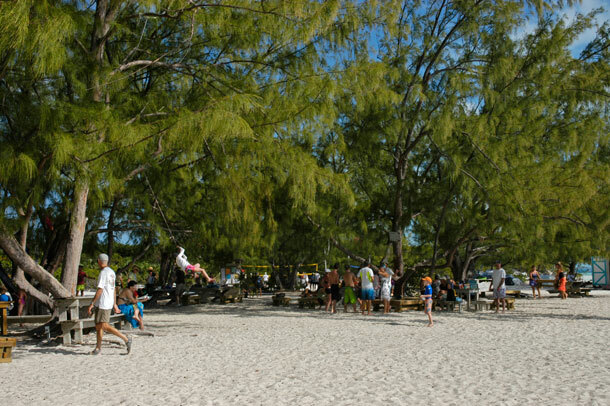 With the regatta, there are also yacht and dinghy races, a model boat race for the kids, scavenger hunt, pet parade, dancing, and a conch horn blowing contest. Drama? We’ve got a little of that too. Elvis, the the water taxi guy, has a huge trash dumpster for the cruisers. 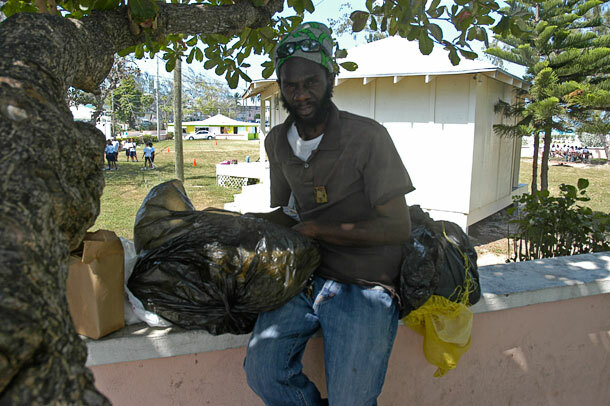 But he had it removed after some yahoo left bags of trash on his taxi dock. Once in a while someone gets impatient in the morning VHF net and makes static to drown out an announcement. This sets off all kinds of recriminations and suggestions about how to deal with the anonymous jerk, extending the hour long program by another 15 minutes. Excitement? We had a bit of that on Sunday March 3rd when the last big northern front of the season came through (supposedly). 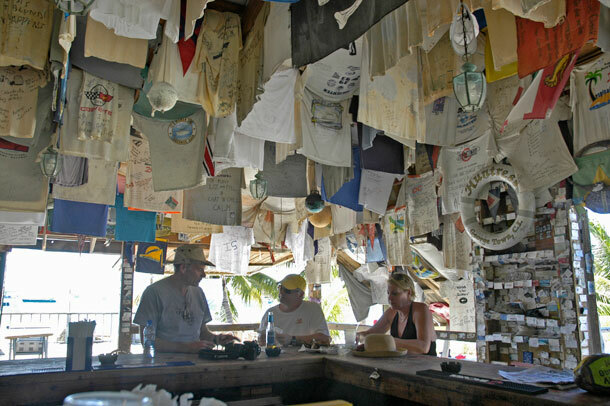 We sat in quiet Crab Cay listening to the VHF chatter from Monument Beach, where boats claimed to have three foot breakers, and winds over 40 MPH. People called their neighbors to report yachts dragging anchor, lumber floating toward boats, and loose dinghies and kayaks. We did accomplish a lot here in Georgetown. And we did meet folks and have fun. 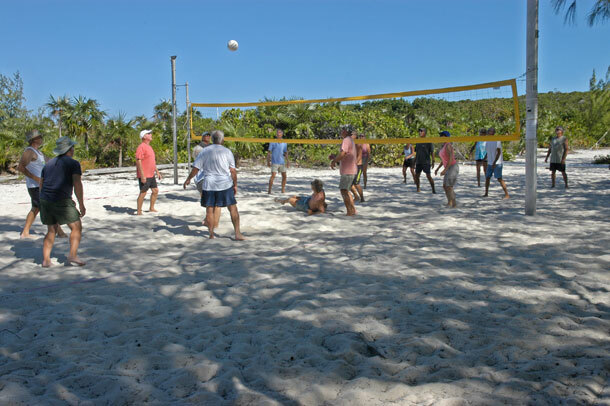 But with so many activities going on I always felt as though we were missing something. 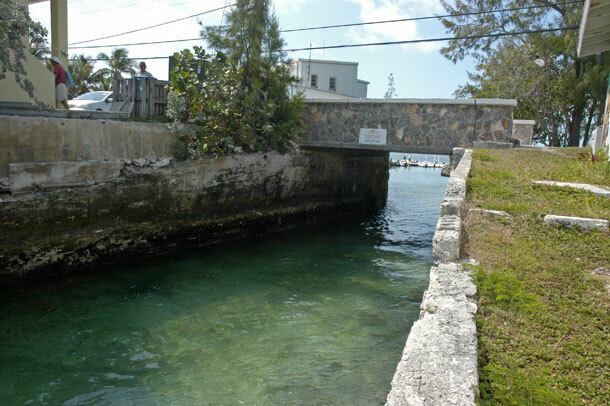 Entrance to Lake Victoria in Georgetown. It’s barely wide enough to row through. At mid-tide the current is too strong to row anyway. We had to take a tow once. Dinghy dock in Lake Victoria. 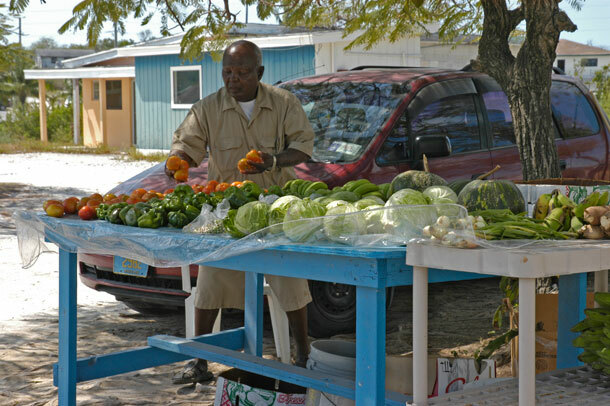 Free water is provided by Exuma Market at the dinghy dock. The spigot itself is maintained by volunteer cruisers. There is always a line, so it’s a good place to catch up on the latest news. Produce farmer and vendor in Georgetown. Fill your bag up then he’ll give you a price. Derrick the Peanut Guy. Look for him behind Pet’s Place deli in Georgetown. He’s the one with bags of freshly roasted nuts on the hood of his truck. Mmmm. Boats anchored at Sand Dollar Beach on Stocking Island. 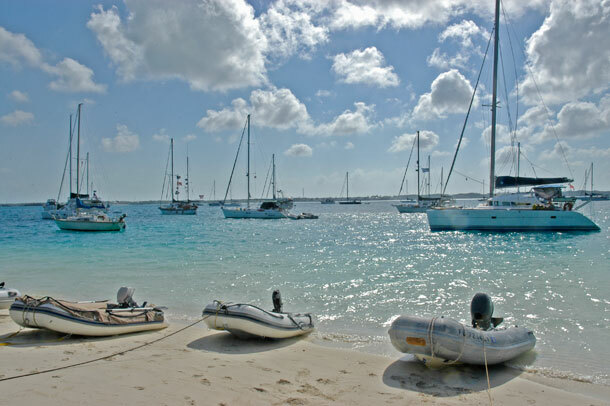 Some boats are tucked in so close to the beaches on Stocking Island their crews can wade up to the activities. As announced on the morning cruisers’ net in the safety slot — be careful to look both ways before walking past the new kids’ swing. Chat and Chill bar and restaurant on Volleyball Beach. 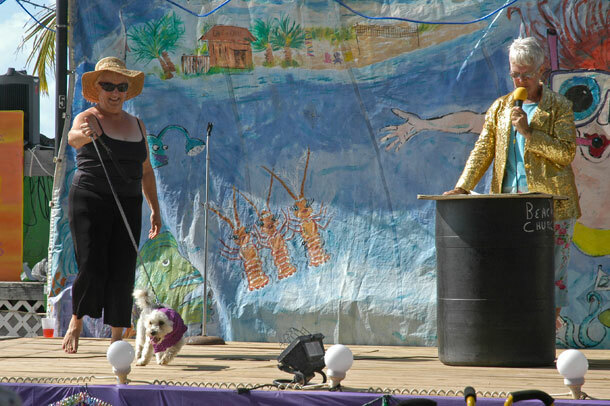 Dog show entrants strutting their stuff. 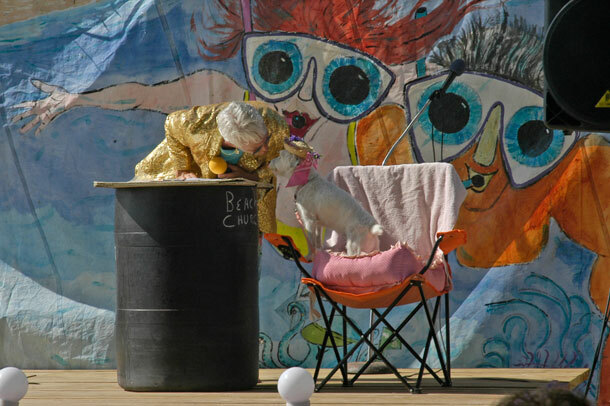 This Jack Russel (who reportedly doesn’t know he’s a Jack Russel) gets a kiss from Mommy the Emcee. Folks mill around Volleyball Beach after the dog show and before Rockin’ Ron spins dance tunes on the opening night of regatta. 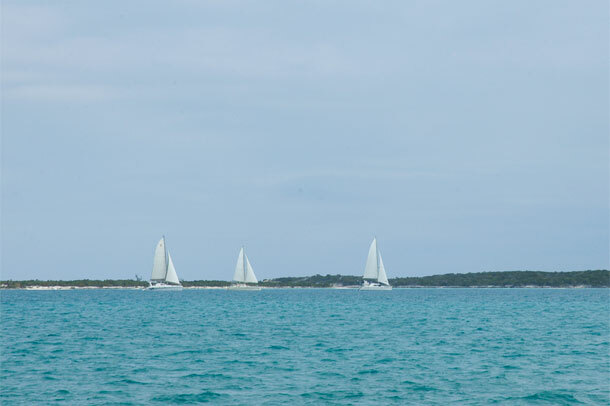 Boats racing around Stocking Island in the cruisers’ regatta. 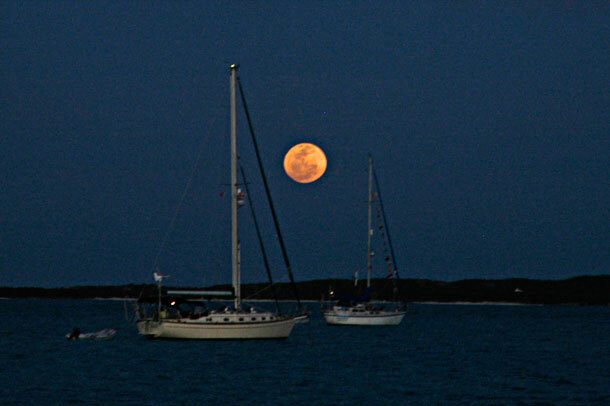 Moon rises over Kidd’s Cove (named for Captain Kidd).